DOCTOR’S BAG POST – The government’s revised co-payment plan is a dog’s breakfast. Here are 9 reasons why the proposal has angered Australian GPs. Prime-minister Abbott’s reference to sausage machine medicine is insulting. If the government is unhappy about the way some clinics churn through patients, they should do something about it, but not punish all Australian GPs – and patients. “Public spending on health as a percentage of GDP is among the lowest in the OECD. Only Chile, Estonia, Hungary, Israel, Mexico, Poland and the Slovak Republic channel less of their GDP into health via the government. Yes, research shows that increased out-of-pocket costs stops people from going to the doctor. This is not rocket science. Research also indicates that areas with the fewest GP services have higher hospital costs. It’s not rocket science either to figure out that more patients will need to attend the free, but more expensive emergency departments of public hospitals, thus increasing overall health expenditure. Unfortunately, out-of-pocket-costs will not weed out unnecessary visits. It will also deter people with a serious illness from going to the doctor – especially people who are on a low-income. If the revised co-payment plan will cut the amount of visits to the doctor, a highly skilled, expensive medical workforce will be doing less work. The revised co-payment plan will not change the opportunity cost of medical care. The government wants GPs to work longer for less. Up to ten minutes of work now pays $37.05, but if the revised co-payment plan goes ahead, the government will only pay $11.95 – a drop of $25! Note that $11.95 is not doctor’s income: After practice costs (staff wages, rent etc) and tax are deducted about $4 will be left for the GP to spend. Look at the chart and it is clear that the expected drop in revenue, in combination with ever-increasing costs, will make GP practices unsustainable – unless fees go up. The fees will need to cover the before mentioned $25, and will continue to rise more in later years as the rebate will not go up until at least 2018. The revised co-payment plan may stop certain clinics from bulk billing, but will not prevent these clinics from undercutting more comprehensive GP services. The gap fees of those clinics will likely still be much lower. In summary: This plan will alienate GPs, shift costs instead of making real savings, and not improve care in any way – it will only make things worse. 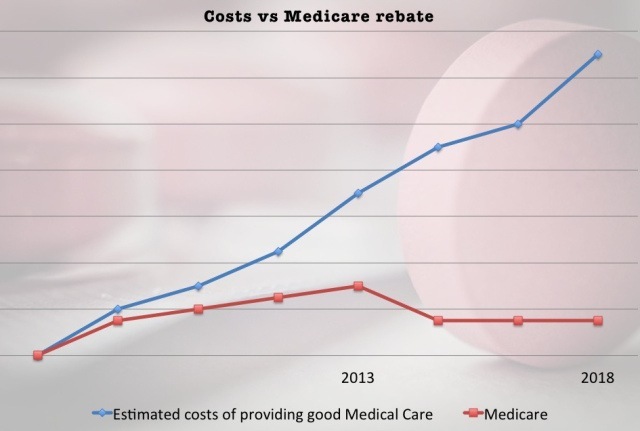 “Your government is taking advantage of GP benevolence with your cut to Medicare rebates. We’re sick of being kicked around. While most of my colleagues are too busy looking after patients to play political games, this time I think you may have woken a sleeping giant.